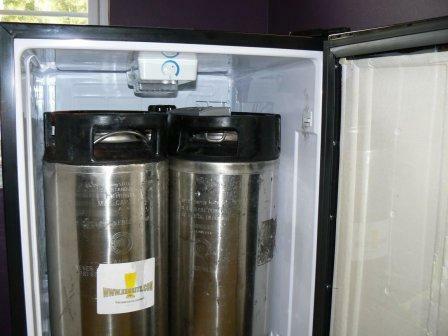 Eric, a local homebrew club member and customer just finished converting a Danby Model DAR440BK mini-fridge into a nice 2 keg kegerator and he was nice enough to let me post his instructions on www.kegkits.com. This fridge is only 4.4 cu ft but as you can see from the picture, everything fit! 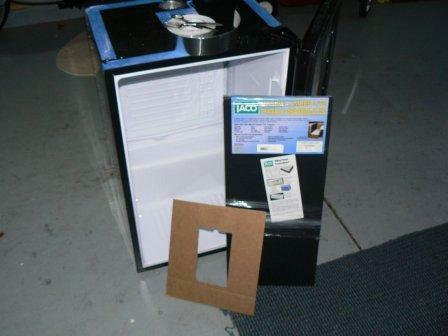 He bought the fridge at HHGregg for $180.00 but the same model is also available at Wal-Mart on-line for slightly more. And one nice thing about Wal-Mart on-line is - you can order the fridge on-line, have it delivered to your local Wal-Mart store and you will not need to pay any additional shipping cost. 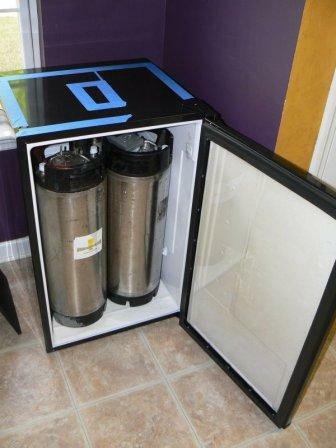 I'm sure that many homebrewers have considered converting this model but did not because of where the thermostat is located - dead center on top, where most of us want to mount the beer tower. 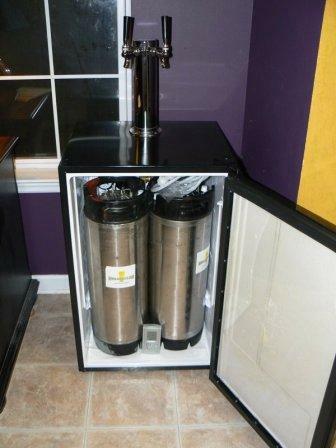 But as you can see from the picture, the tower actually looks great mounted towards the back of the kegerator. 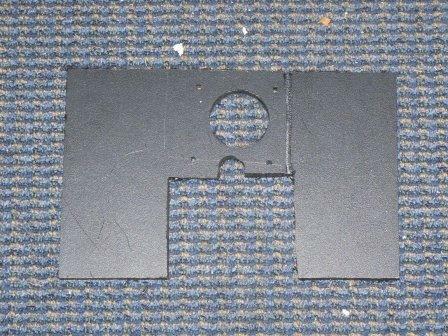 Or a 2.5" - 3" hole saw (Eric used a hole saw). The first thing you'll notice is - the thermostat is in the top and is also dead center. You'd think that this would get in the way of the kegs and the tower but you can see from the picture that there is plenty of room for the kegs. It's hard to tell from the photo but only the front edge is dry. The rest is still wet. Eric verified through Danby that there were no refrigerant lines running through the center of the top. According to Danby there is a refrigerant line running across the top front. There are several ways to confirm this and my method is to plug the fridge in & feel around the top until an area is warm. Eric did the corn starch test. 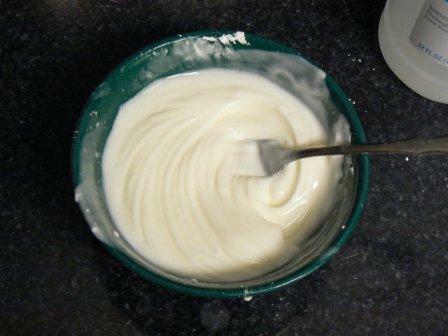 To do this test, you mix a batch of corn starch & rubbing alcohol into a paste then you smear it onto the top. The area above the refrigerant line will dry first because of the heat. The test confirmed that the line is running across the front. Eric still had questions to answer, like what was under the thermostat and were there any wires where he wanted to drill. He went ahead & pulled loose the thermostat, looked underneath and found some wire leading to the front (good news). Instead of just trimming away the door features that were in the way, Eric decided to install a clear acrylic sheet. You can buy the sheet from any home improvement store. 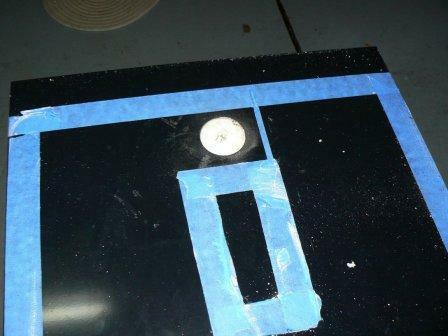 It helps to remove the door panel so that you can work on it on a table top. Also, you could do the same thing with a thin sheet of plywood. Picture of the inside of the door with the sheet installed over the door insulation. Eric made a template from the bottom of the tower. 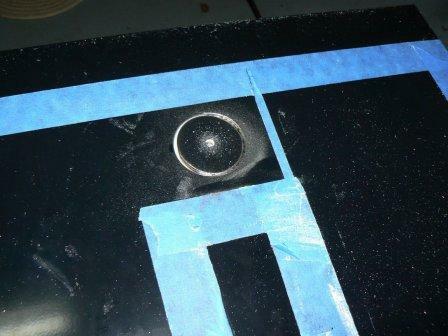 He even drew the screw holes, which will help later. 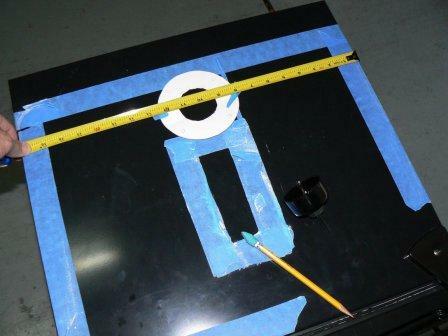 Then he carefully centered the template on the refrigerator top. 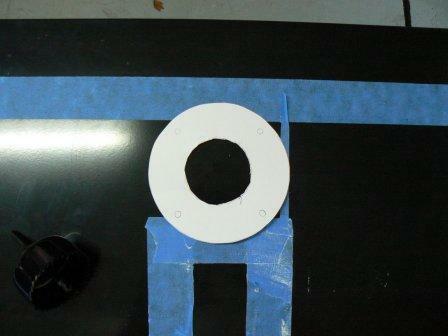 This is a critical step because even a small amount off center will be very noticeable. 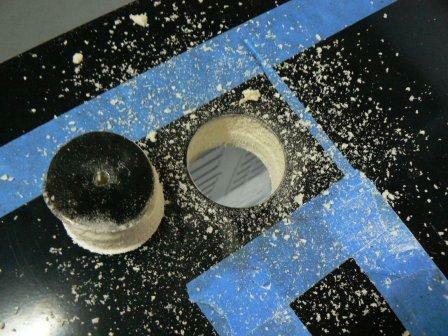 Once he was happy with the centering, Eric started drilling. 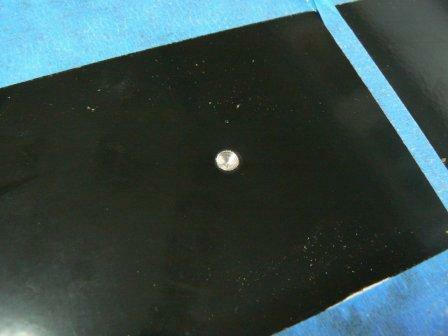 Drilling goes very slow because hole saws are designed to cut through wood, not steel. But if you take your time the saw will eventually cut through the top. As soon as the hole saw breaks through, you should stop and check for wires. 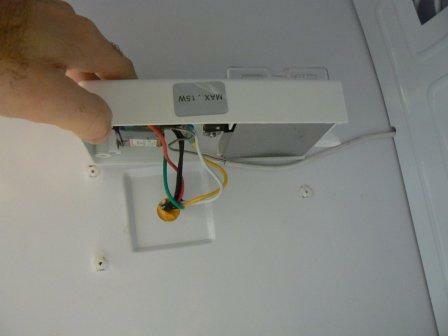 Once you determine there are no wires then it's safe to drill all the way through to the inside of the cabinet. 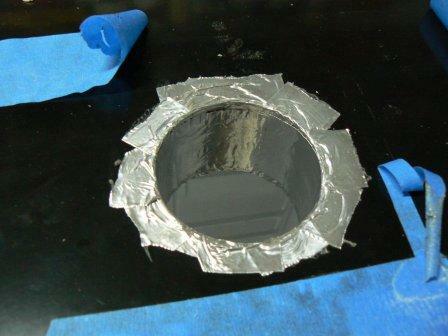 After cutting the hole & cleaning up the mess, Eric lined the opening with foil tape to help keep out moisture. 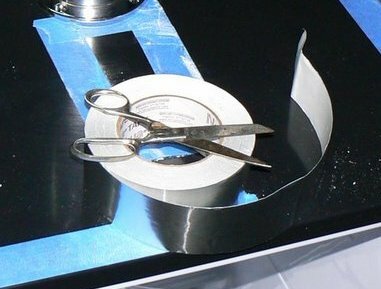 This tape is available at all home improvement stores - just ask for the foil tap that's used on air conditioner ductwork. Here's a picture of the inside with the foil tape in place & the beer tower just sitting on top. 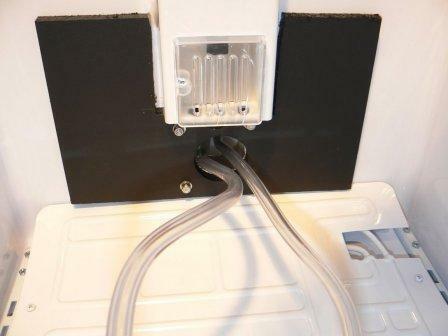 Because the steel on these refrigerators is very thin and the inside liner does not give too much support, many who convert a kegerator mount some kind of board on the inside for additional support. 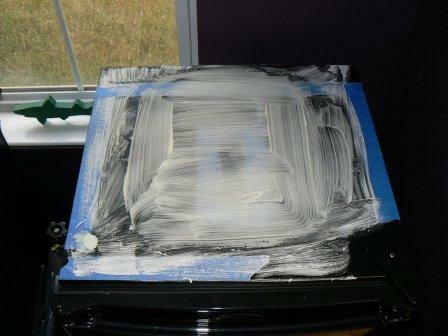 Eric decided to do this and he used a piece of "Marine Lumber" polysheet because it will not absorb moisture. 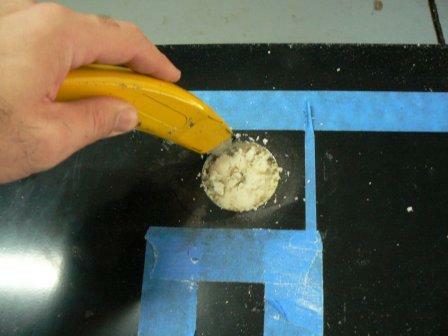 A support cut from plastic cutting board or thin sheet of plywood also works great. 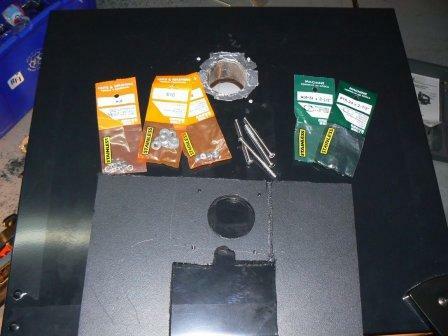 Notice, he also drilled the mounting holes through the support panel - he drilled the 4 mounting holes through the top at the same time. Our beer towers come with mounting hardware but the hardware is intended for mounting on a wooden bar. Eric bought all stainless steel hardware. 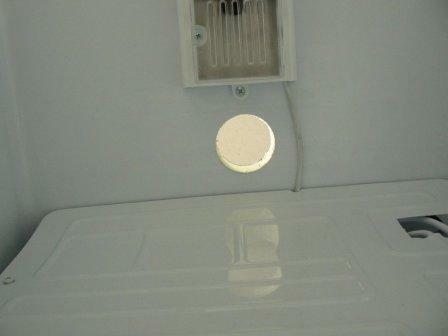 You just place the tower on top of the fridge, drop the mounting screws through and slide the plate onto the bottom, slide on the washer lock washers and then tighten the nuts. 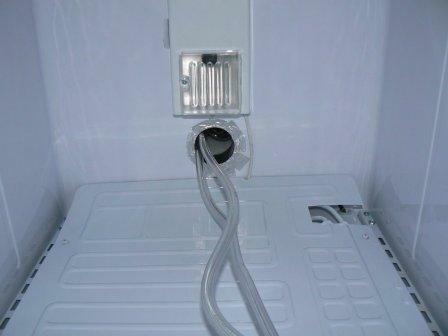 The refrigerator top is sandwiched between the tower and supporting plate, making the tower mount very strong. And when you are done - the completed conversion!